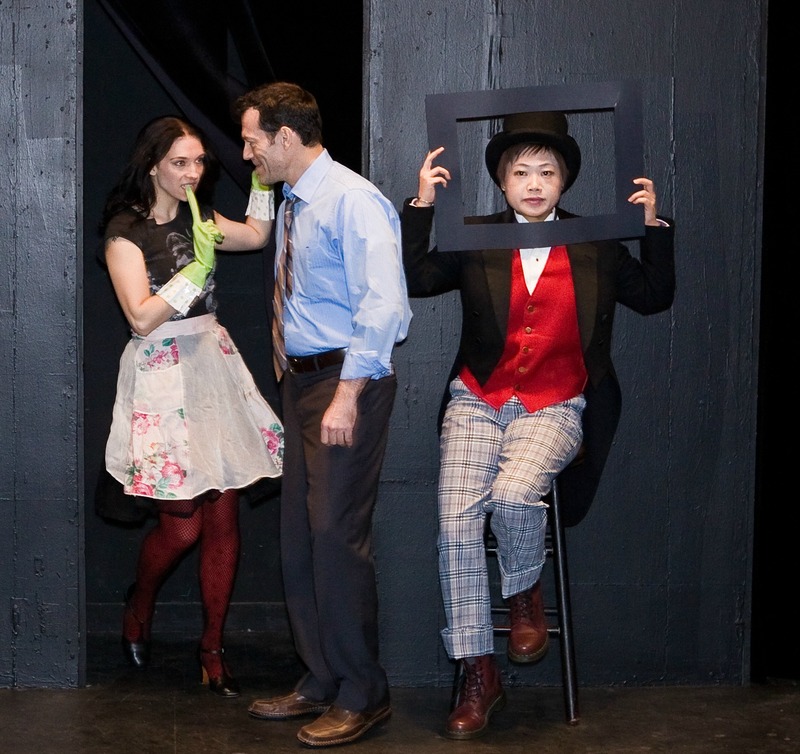 Mel House, Joel Nagle, and Mariko Iwasa in "Rabbit Island"
What would you do to prove your bona fides as a New Yorker? You might say, yo! Jerk face! I was born here! Uhv course Ahm a New Yowkah! You, sir, have nothing to prove. But what about those of us who moved here? Particularly those of us who moved here from The Sticks, the Great Flyover, or, worse yet, the wilds of the Great White North? NYC’s concrete jungle has many nooks and crannies in which the city’s diverse fauna may hide: the Bronx Zoo, Flushing Meadows, “East” Williamsburg, “Bushwick” (a.k.a. Ridgewood), Coney Island. Fact: Coney Island was at one time actually an island overrun by rabbits. And in Jolly Olde England rabbits were called coneys. Hence the name. Fact: at the end of the 19th century (before Brooklyn was incorporated into New York City) Coney Island was a haven for rogues, scoundrels, and scofflaws who lived on the beach in shantytown shacks and took advantage of both recent immigrants and plentiful clams. Even then Rabbit Island was renowned for fast talkers, sharpers, and blackguards. This New York, real and idealized in the same breath, is what Chris Harcum evokes in his new play Rabbit Island, playing now at the Kraine Theater in the New York FRIGID festival. Funny thing about this town – sometimes it gives you a directive. Never something easy or fun, New York has a way of crushing your dreams into a glittery powder and then telling you what you really think as it blows dream dust into your eyes. That’s when you find out what you have to do in order to become a real New Yorker. Alex, a Canadian transplant, moved to NYC to make it as a mime. While pursuing this dream he gets involved with a couple of women, Karen and Barbara, and a therapist qua fast talker, sharper, and blackguard, Dr. Bob. At first the two ladies don’t like Alex. He is a nice guy – you can hear it in his Canadian accent. Dr. Bob likes Alex even less, ‘cause Dr. Bob is the evil Id of NYC incarnate. Bob is a wolf with a taste for rabbit flesh, and Alex is a rabbit. Bob tells Alex the only way to get over his neuroses is to grind his soul into a glittery powder and pour the ashes into the East River. So Dr. Bob gives Alex an assignment: he must bare his most private self on the street and “get it all out” – literally. Though the production is spare, the script is tight, fast, and full of genuinely funny jokes. Ethan Angelica, Carrie Heitman, and Mel House never let the beat drop, and Joel Nagle as Dr. Bob channels the mercurial menace of New York beautifully. Director Aimee Todoroff sews the whole thing together into a seamless hour of hilarity. As the lights go down for the last time, Alex earns his ears and fulfills Dr. Bob’s directive. Best of all, he’s found someone to share the moment. Because nothing makes you more of a success in The Big Apple than holding hands with a loved one as you squeeze out the rest of your soul onto the sidewalk.